I just wanted to show you this year's little desk calendar. It is actually a recovering of last year's. It is just the perfect size for my desk and the calendar is actually big enough for me to see! The base is sturdy chipboard, covered on both sides and then embellished. Easy peasy!! 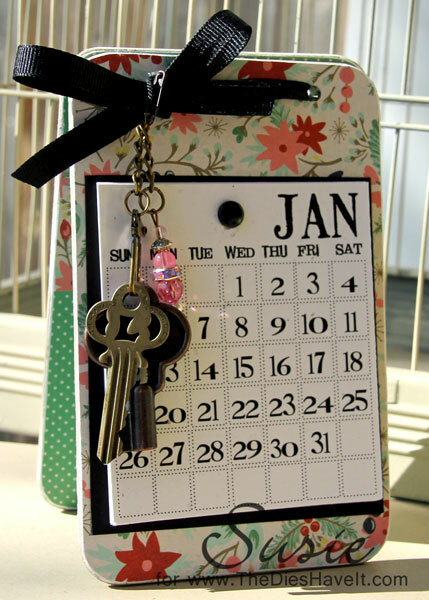 The calendar is attached with a brad and easily rips away when the month is complete. If you are wondering where to get the printable calendar, click HERE. Every year, Paula Cheney offers a free download of the upcoming year's calendar. What an awesome gift! Enjoy your Monday and I'll see you right here tomorrow. I love this calendar idea!! You are so talented! !